Interacting with BJP booth level workers via video conferencing, PM Modi said Rahul Gandhi's keeps repeating things like a 'stuck gramophone'. Mocking Rahul Gandhi over his continuous attacks on him, Prime Minister Narendra Modi on Wednesday said that people of the country won't accept the Congress chief's 'childish lies'. Interacting with Bharatiya Janata Party (BJP) booth level workers in poll-bound Madhya Pradesh, Chhattisgarh, Rajasthan and Uttar Pradesh via video conferencing, PM Modi said Rahul Gandhi's keeps repeating things like a 'stuck gramophone'. To a question from a worker as to how they should respond to opposition leaders' 'abuses' like calling him a scorpion - an apparent reference to Congress leader Shashi Tharoor's recent remarks, Modi said they were offering him what they had. He was glad, the prime minister said, that he was of any use to them as it allows them to vent their anger and spend their time "happily" with their family members in evening. Citing an anonymous RSS functionary's comments to a journalist, Tharoor had said that Modi was like a scorpion sitting on a Shivlinga which can neither be removed from hand nor hit with a chappal. 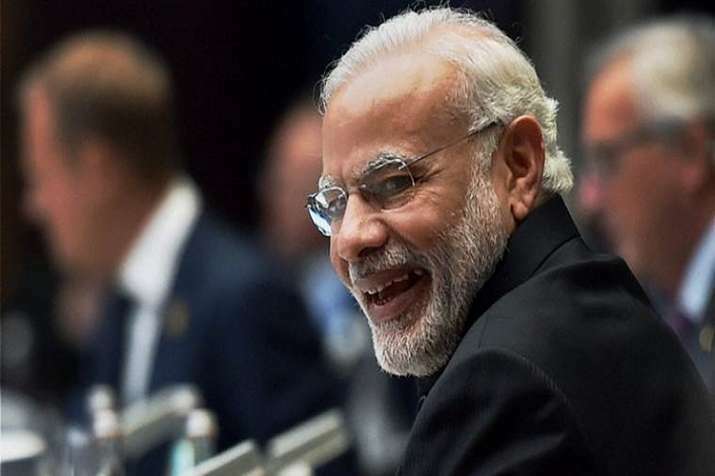 Modi, however, made fun of Rahul Gandhi when a party worker asked him as to how they should respond to the Congress president's comments in his rallies that there should be mobile manufacturing factories in those areas. "There used to be gramophone records earlier. At times, it would get stuck and play same words again and again. There are some people like it. One thing occupies their mind and they keep repeating it. You should enjoy it. Don't get tensed," he told BJP workers. These people don't know that time had changed and it was no longer easy to fool people, Modi said, adding that nobody accepts such childish remarks. People make fun of it, he said. India had become a leading manufacturer of mobiles with over 100 factories producing them now under his government compared to only two that existed when he came to power in 2014, the PM said. He wondered if mobile was invented after he became prime minister as he attacked the previous government. Modi also targeted Gandhi without naming him over his recent criticism of the central government on the issue of OROP (One Rank One Pension) for ex-servicemen. Congress governments were in power for decades and soldiers kept demanding OROP, he said, adding that they were not even heard. Since his government has implemented it so his rivals were concerned over ex-servicemen's 'love' for him and repeating 'lies after lies', he said. Modi claimed that 'lies' of Congress leaders against the BJP and its governments on certain issues indicated his dispensation's success as he referred to his 'digital India' campaign which, he added, had made lives easier for crores of people by letting them avail of government benefits sitting at home. "While opposition parties treated the poor like a vote bank, the BJP believed in empowering them so that they can pull themselves out of poverty," PM Modi said.